In the last 24 hours, a couple of developments coming out of the US have shaken up American cryptocurrency communities. First, the US Securities Exchange Commission has sent out letters to possibly hundreds of crypto-companies asking them to voluntarily hand over documents relating to their crowdsales. The SEC is clearly concerned with whether such crowdsales run afoul of the commission’s regulations, and there is a gag order attached to these requests for voluntary cooperation. Second, the Financial Crimes Enforcement Network (FinCEN) has offered a little clarity on its position regarding digital currency exchanges and payment processors, concluding that these businesses most likely fall under the United States’ definition of money transmitter and thus, must apply for licenses. Let’s take these stories one at a time. Coin Fire broke the story about the SEC’s letter Monday night, reporting that the SEC had sent out secret requests for information to cryptocurrency companies as early as last week. “[S]everal hundred letters are now going out to a plethora of companies,” Coin Fire’s mononymous reporter Mike wrote. “The letters are being sent out to companies performing offerings on Counterparty, Cryptostocks, companies hosting offerings with colored coins, and companies who have performed unregistered securities offerings via Bitcoin Talk. In all cases, the SEC is employing a team of researchers to track down the people or companies behind each offering via forum messages, domain registration information, transfers of funds via exchanges and other means. It is not clear how related these next two pieces of information are to the abovementioned investigation, but news from the SEC is all over the Bitcoin community this week. 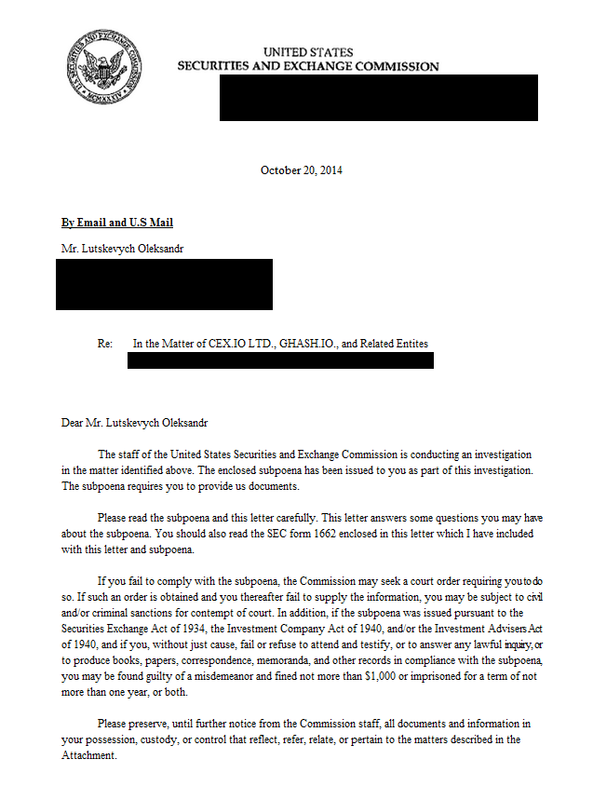 First, a post on the /r/bitcoin subreddit from Monday evening alleged to show an SEC subpoena sent to CEX.IO on Oct. 20. That turned out to be a hoax. "It's fake," CEX.IO CEO Jeffrey Smith said. "There is no such thing." Also, the Wall Street Journal is reporting that former SEC Chairman Arthur Levitt has joined two Bitcoin companies in an advisory role: payments company BitPay and Vaurum, an exchange designed for institutional investors. On Monday evening, FinCEN released a couple of rulings that in effect classify exchanges and payment processors as money transmitters, which means that those companies fall within the licensing jurisdiction of FinCEN. In response to a couple of letters sent to FinCEN in late 2013, the regulator ruled that both Bitcoin exchanges and payment processors might actually be money transmitters on the basis that they match buyers on their platforms with sellers. This doesn't come as a big shock regarding exchanges, but the second letter suggesting payment processors themselves might be considered money transmitters caught many by surprise. Caleb Chen at CryptoCoinsNews tied together these two events — FinCEN’s announcements and the SEC’s letters — in a way that might give American crypto-companies pause. “The SEC is working closely with IRS accountants, the aforementioned researchers, and possibly FinCEN, who just clarified their virtual currency guidance in a way that might make prosecution much easier for the SEC,” Chen wrote.